﻿ Possible Reasons Why OSRS Gold Price is Crashing Nowdays! Possible Reasons Why OSRS Gold Price is Crashing Nowdays! As we all know, We are the Best place to Buy OSRS Gold online and as a result, we like to keep track on what the current prices for many different items are. 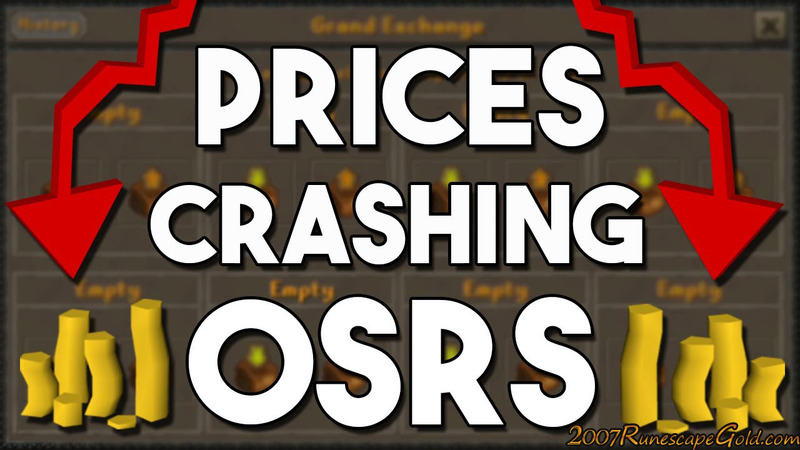 Well sometimes like just now, thanks to this great video from YouTuber, FlippingOldschool, we have a little more insight as to why so many people are saying prices are crashing in Old School Runescape. He says that there is not as much money coming into the game. We think this is pretty interesting and of course, if there is not a ton of money in the game, then of course price would be going down. If people are having a harder time to make Osrs gold, then there simply is not enough money to go around. He uses the term, Runescape recession which is pretty interesting and he also makes the point that people who have a ton of money are no investing it in the same way. He has a graph on the video that does show that items are starting to creep up, but they are still just way lower than what they were just a week or two ago. Also, people are flooding the market with items as they are worried items are going to crash even more so they are having so sell them at a lower price! We know that in games like Old School Runescape, prices will always fluctuate a little bit, but the last couple of weeks sure have been kind of nuts! What are you guys thoughts on the way prices in Runescape have been crashing? Also if you want to get the biggest bang for your buck then look at our very low priced Old School Runescape Gold.